Challenges. I want to do more of them. It can be hard to fit them in between DT assignments and everything else, but the truth of the matter is, I love them and I want to do them for ME! So...today, I present to you a challenge card! YAY! I decided to go with the Take Three Challenge over at Less is More for this one. I love clean and simple cards, you guys know that, and the thought of combining three challenges in ONE clean and simple card is just TOO much fun to pass up! So...here is my card! ACK! Is that ladybug not just the cutest EVER???? He is a Stampendous! stamp and he comes in both wood and cling! I know the wood is available at Michael's, too, so a great way to use that coupon! The sentiment comes from the fabulous Happy Messages Perfectly Clear Stamp Set (also available at Michael's and online). This is one of my favorite sentiment sets! The fonts are nice, clean, and perfect! I colored him with Tombow markers and added just a touch of extra red by punching circles from a scrap of cardstock and adhering them with my Xyron X. The three challenges I pulled from LIM are the #47 Just One Word Challenge, the #55 Punches or Die Cuts challenge, and the #56 Don't Scrap It challenge. My one word sentiment, five, simple punched circles, and the scrap used to punch them from came together in a super fun little CAS card! Love that! I have to tell you...I'm a little surprised that it is only Thursday today. I mean...shouldn't we have hit Friday by now? HA! Oh, well, tomorrow shall come. In the meantime, I think I shall sip my tea and attempt to have a productive day. OH! If you get a chance head on over to the May Arts blog! We have partnered with Sweet Stamp Shop and there are lots of fun projects and giveaways including my own set of three cards! Check them out! So sweet, love that ladybug! this is just way too cute!! 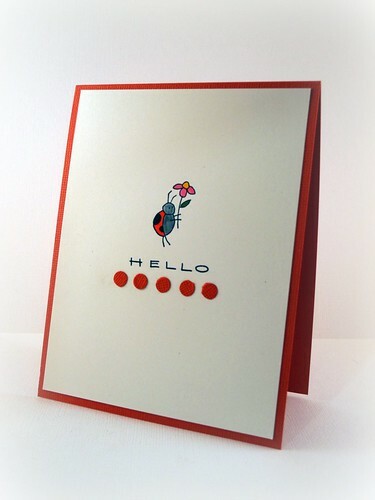 might have to look into this stamp- my aunt's birthday is coming up and she LOVES ladybugs! great inspiration! Ooooooh! Kai is in LOVE with Ladybugs! And THIS happy-looking lil' guy is adorable! (Kinda like our Jingly-girl!) I HAVE been looking at all your week's creations - just having a bummer week here so keeping a bit to myself. Glad YOU are continuing to express yourself in your wonderful art! Hmmmmm ... maybe I should start having jellybeans for breakfast ...???? 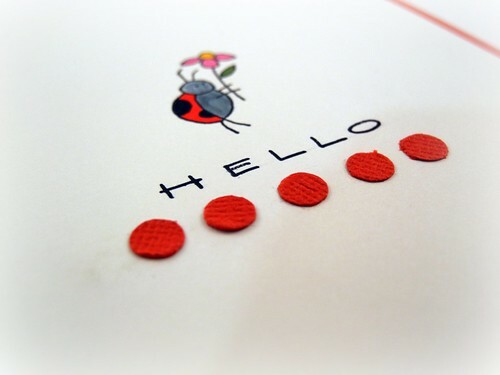 aww i really like this...Love that little ladybug...so cute.. So cute ... love the ladybug! This is lovely....wow so simple but so effective, well done. I love simple cards and this one is adorable!! This is so cute~love simple little cards!!! Great job!!! Very cute, very clean and simple. LOVE it! Um, hello! This is probably my new favourite of yours! I'm loving the CAS layout. Those textured dots are so cute! I am in love! You know I like simple cards and this one is a beauty. May have to borrow this challenge for my next week card. The red circles are a wonderful embellishment. This really is a cutie! I never knew a bug could be so cute! :-) Such a sweet card! Such a cute & sweet card. Amazing that you were able to fit all those challenges into one card! WOW! Awww your ladybug card is so cute. Wow 3 challenges for 1 card, good going. I thought it was Friday today. Then realized nope one more day to go, lol. Love the little row of punches - just the right amount of CAS embellishment!